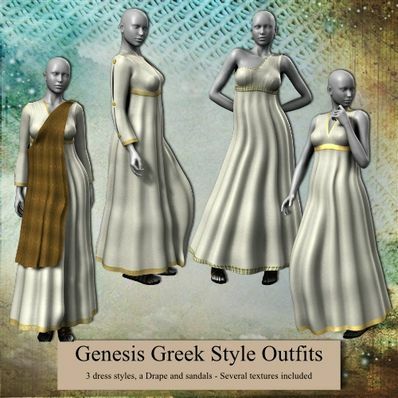 Greek Style Outfits for Genesis for use in Daz Studio 4. 3 different styles of dress, plus a drape and some sandals. Several textures included. Will work with most poses and shapes. Thank you, but why is here only 'Greek Style Female' and 'Roman Style Male'? Need Greek Male and Roman Female! Thank you... I love the outer piece especially! Outstanding and again thank you so much for the sandals as well.